MPs on the public safety and status of women committees heard testimony today from the RCMP Public Complaints Commission and RCMP Commissioner Bob Paulson on recent reports of harassment in the force. RCMP Commissioner Bob Paulson says he's doing everything he can to increase the number of women in uniform. Paulson made the commitment during testimony today before the House of Commons status of women committee. 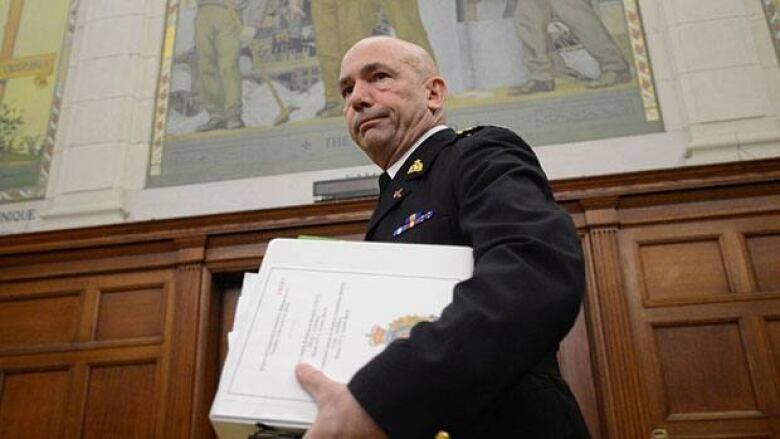 Paulson was testifying after the Commission for Public Complaints Against the RCMP released a report two weeks ago calling for fundamental changes to the way the Mounties handle harassment complaints. The commission stopped short of identifying a systemic problem of sexual harassment within the force, despite intense publicity about difficulties and grievances. Paulson says he wants half of all new recruits to be women within two years to help reach the goal of having a national police force that is 30 percent female by 2025. Ian McPhail, interim chairman of the complaints body, said the RCMP needs to do more to encourage men and women to come forward with complaints of harassment. McPhail, other officials from the complaints commission and Paulson gave back-to-back testimony today in front of two separate Commons committees: public safety and status of women. Both committees are examining issues raised by recent reports on workplace harassment in the RCMP. The Feb. 14 report from McPhail's commission found that the RCMP has a bullying problem that needs to be countered by better training and record-keeping. The commission launched its investigation in November 2011 in reaction to widespread reports from female Mounties about systemic sexual harassment. About 90 per cent of the complaints examined for McPhail's report involved bullying. Only four per cent of the complaints dealt with sexual harassment. At the same time, the RCMP released its action plan to combat sexual harassment on the force. The status of women committee had previously heard from other RCMP representatives in November, as part of its ongoing study of workplace harassment issues. On Feb. 13, New York-based Human Rights Watch researchers who had visited visiting 10 communities between Prince George and Prince Rupert, B.C. – along the province's "Highway of Tears," where 18 women have disappeared over the past several decades – issued a damning report suggesting abuse of aboriginal women at the hands of RCMP officers, including allegations of police threats, torture and sexual assault. That report called on the federal government to launch a national inquiry into the RCMP's conduct. The Harper government has not agreed to a national inquiry, but MPs from all parties are supporting a Liberal motion in the Commons which calls for the formation of a special committee to investigate Canada’s missing and murdered Indigenous women and girls and recommend solutions to address the root causes of this violence.